The Rosetta Stone is currently the most visited piece at the British Museum. The Grand Egyptian Museum is calling for the return of the Rosetta Stone to Egypt, according to director of the new Grand Egyptian Museum (GEM) Dr. Tarek Tawfik, after being displayed in the British Museum for more than 200 years. “It would be great to have the Rosetta Stone back in Egypt but this is something that will still need a lot of discussion and co-operation,” Dr Tawfik told the Evening Standard. The ancient slab, which is engraved in three languages and single-handedly unlocked the secrets of the hieroglyphs, and hence the entire Egyptian civilisation, has created tension between Cairo and London for some time now. It’s engraved with an identical message in Ancient Greek, Demotic and Egyptian hieroglyphs, which is what allowed 19th century scholars to decipher it into hieroglyphs. It was found by French soldiers in 1799 in a Nile-delta town called Rosetta (hence the name), as they were rebuilding a fort during Napoleon’s campaign in Egypt. Napoleon was interested in arts, culture, and history, so he took along a group of scholars with him to Egypt and told them to seize all important cultural artifacts. After defeating Napoleon’s army in Egypt, British soldiers stole the piece and transferred it to the British Museum, and it’s been the most visited-object there since. Dr. Tawfik claims being in “vivid discussions” about the return of the historic artifact, though a British spokeswoman from the British Museum said that “they have not received a request for the return of the Rosetta Stone from the Grand Egyptian Museum”. This is the best part though – Dr. Tawfik suggested virtual reality be used in order to reach a compromise and a “way of co-operation and means of complementing each other between the museums”. Is he suggesting the British Museum display the artifact in virtual reality, and give Egypt the real one back? Or is it the other way around? 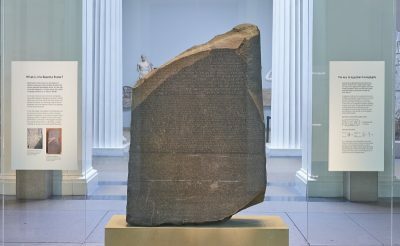 The Rosetta Stone has been desperately pursued by Egyptian authorities, who have never been able to convince the British Museum to give back what belongs to Egypt on the basis that it was legally taken out of Egypt… By colonising forces, we may add. Featured image is from The British Museum.